Infrared security cameras have the capability to capture video in low light and no light (0 Lux) areas. Infrared cameras (IR) are sometimes referred to as IR cameras or "Night Vision Security Cameras" because of this. Infrared cameras have IR LEDs positioned around the outer edges of the camera lens which gives the camera its "Night Vision". Infrared Cameras can capture acceptable video in total darkness and even better quality video in low light. Even a small amount of ambient light helps the overall night vision capability of IR cameras a lot. IR cameras are available in various body styles, such as dome and bullet styles. There are also specialty cameras such as license plate recognition (LPR cameras). The best infrared cameras use a technology called "Smart IR". Please select from the below sub-categories or browse all camera types below. CCTV Camera Pros also sells complete Infrared Security Camera Systems. You Learn more by reading our FAQ and watch demo video surveillance footage captured by IR cameras here. Here are some frequently asked questions that we receive about infrared security cameras. How do infrared cameras work? Infrared security cameras use built-in IR LEDs, an IR cut filter, and a photon detector (light level sensor) to enable their "infrared / night vision mode". The photon sensor is used to detect when light levels are low. When light level goes below a certain level, the camera's infrared LEDs automatically turn on and the IR cut filter is engaged over the image sensor. The IR LEDs reflect the infrared light of objects within the view of the camera. The IR cut filter enables the camera to capture the infrared light. The result is a black and white video surveillance image. When light levels return, infrared cameras switch back to day time mode and capture color images. Smart IR is a technology that automatically adjusts the intensity of the infrared illumination according to the distance that objects are from the camera. For example, if a person walks towards a camera with Smart IR, the IRs will dim as the person gets closer. This is to avoid the image from being washed out / overexposed. You can see a demo video of Smart IR below. What style of infrared cameras are available? IR cameras are available in all of the standard security camera body styles such as dome and bullet. Do all infrared LEDs emit a red glow? Most infrared security cameras use 850nm IR LEDs which do emit a red glow, however these specialized invisible IR hidden spy cameras use 940nm IR LEDs which are not visible. Are any ultra wide angle lens cameras with IR available? Yes, one of our best selling infrared cameras our AHD-BL25, which is an ultra wide angle security camera with 180 lens. The best infrared security cameras provide a nice even IR illumination as seen in the above image. Please click on the image for a full 1080p version. Notice how the entire view is illuminated by the IR LEDs. Most of the cheaper IR cameras that our competitors sell only illuminate part of the area of the image. Many of the cheaper cameras on the market create an IR circle in the center of the image and the surrounding area is still dark. This image was captured using this HD-TVI-BL2 1080p bullet infrared camera - one of our best selling high definition outdoor IR cameras. An important feature to consider when shopping for an infrared camera is "Smart IR". Watch the above video to see the difference between a security camera with Smart IR vs one that does not. The IR cameras that CCTV Camera Pros supplies have built-in Smart IR. Below is a playlist of videos captured by some of the infrared security cameras that appear above. You can select which video that you want to play by clicking on the PLAYLIST icon in the upper left-hand corner of the video player. Looking for a complete infrared camera system? Check out this page which contains systems complete with cameras, DVR, cables, and power supplies. You can also request a custom quote here. Infrared Cameras are typically used by homes and businesses that have their lights out at night or for outside nighttime viewing. Day/Night Cameras are different from Infrared Cameras and can be used in situations where there is low light. The Cameras that we supply vary in their Lux and also in the distance that they are able to see. 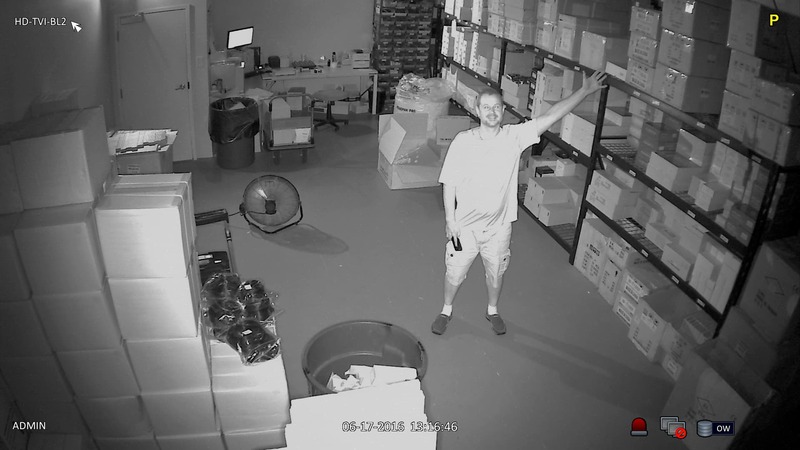 Another feature of some of our Infrared Cameras is that some have the capability to switch from Infrared mode which captures in black and white to a non-infrared color mode. This is a great feature when you need a camera to perform both Light and non-light operations. All Bullet Infrared Cameras come with Free Mounting Bracket and Power Supply. Need advice deciding which security camera is just right for your needs? Please email our sales team at info@cctvcamerapros.net or call 561-433-8488 and one of our CCTV Camera Pros will be glad to assist you. Here are some of our best articles and installation guides related to IR security cameras and video surveillance systems. Which Security Camera Type Is Compatible with My DVR?